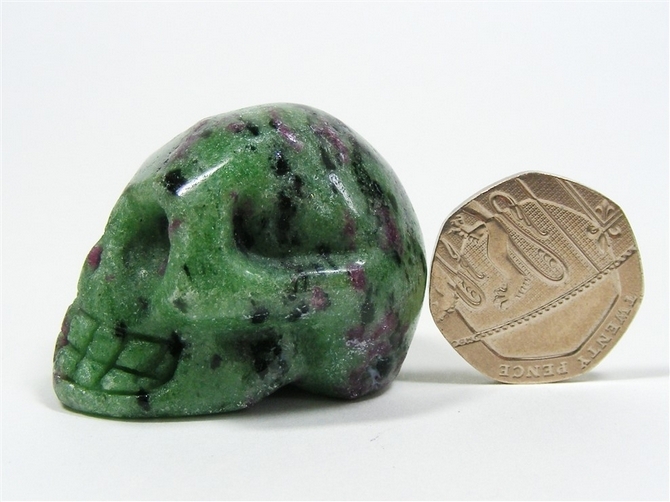 Lovely carving of a skull, cut and polished from a great piece of Ruby in Zoisite with a good green colour and nice flecks of Ruby too. 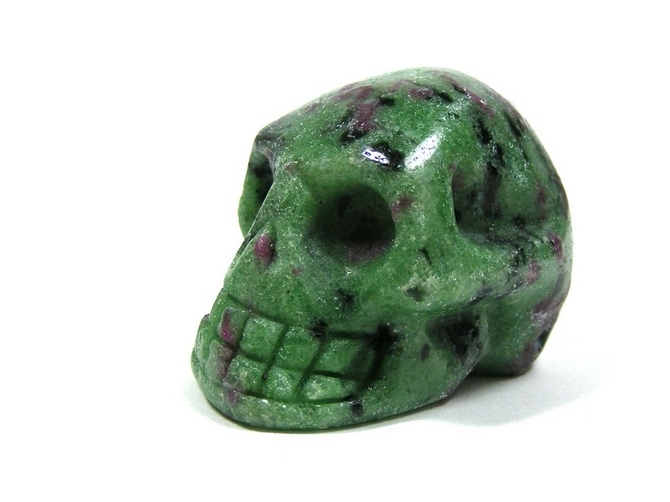 Ruby in Zoisite is believed to help with diseases of the testicles and ovaries, problems associated with disorders of the heart and also the circulation system. It is also said to strengthen the immune system and to stimulate fertility and increase virility. Ruby in Zoisite promotes the will to recover after illness or after particularly intense levels of stress. It encourages creativity and it helps us to talk about our emotions, to get in touch with our suppressed feelings and by giving voice to them, to work through them and to understand them. 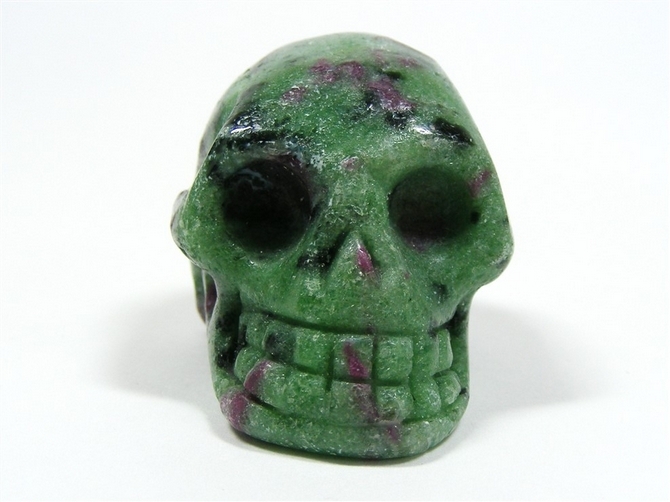 Ruby in Zoisite also helps to bring comfort to those who have been bereaved. It can help us to better understand the reasons behind our losses and to understand others who may be in the same position of loss as ourselves. It helps us to be much more caring and compassionate. 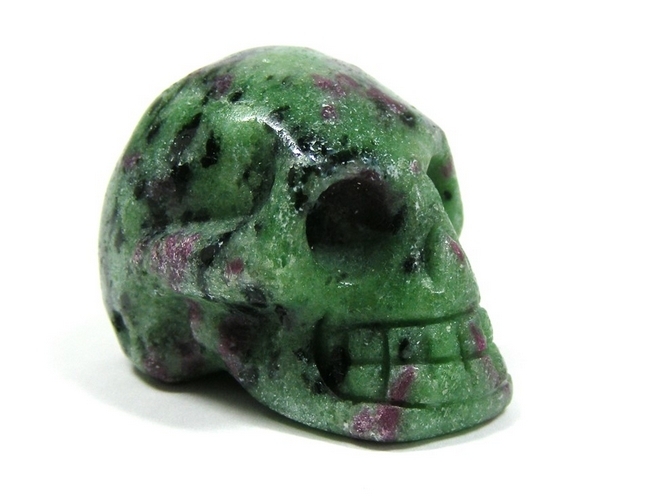 Ruby in Zoisite activates our Crown chakra and helps us to gain access to soul memory and to spiritual learning. It is an extremely useful stone to carry during soul retrieval or past life work. It also helps us to avoid conforming to other peoples ways and ideas by making us aware of our own individuality, whilst at the same time, allowing us to maintain a sense of "connected-ness" to all of humanity.